When I was preparing to compete, no matter what the style was, I hit nerd-mode full on and felt that I had to absolutely maximise my training time working on my ‘A’ game and the peripherals that put me back into my ‘A’ game. As a lot of my coaching, projecting and planning training came from a business environment, I call the ‘A’ game the critical path. The shortest route from A to win. 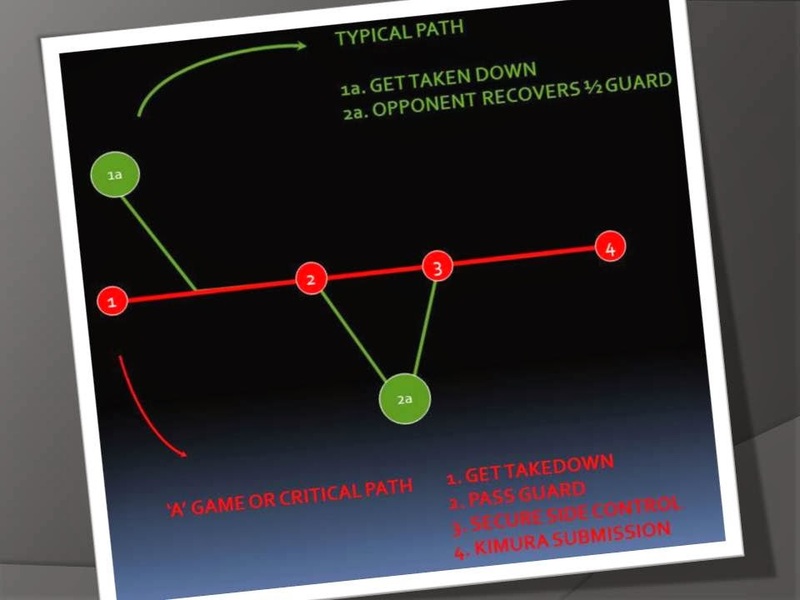 In this example, we are looking to establish our ‘A’ game of takedown, pass guard, secure side control, kimura submission represented by 1, 2, 3 and 4 respectively, shown as a red line in the photo. This is our critical path. As things rarely go to plan we now have the green line representing our plan B that will put us back onto our critical path. You have kept to the critical path where you could and everything else was designed to put you back on track. This is a useful training tool so you can immediately identify where you need most work; at what part do you fall off the critical path? This is not just for competitors but for the hobbyist too that has limited time; pick what you can do reasonably well, work that to death and add bits when you can. If you are doing 1 or 2 classes a week, trying to learn everything is too much and not conducive to actually having an ‘A’ game.